Home » Client Satisfaction Award Winner For 2 Consecutive Years! Client Satisfaction Award Winner For 2 Consecutive Years! 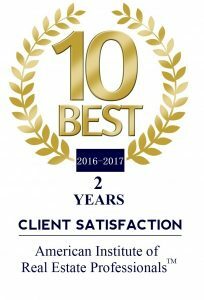 For two consecutive years (2016 & 2017), Chris Glapa and Ruth Sayers of the Ruth/Chris Real Estate Team were presented with the “10 Best Real Estate Professionals for Client Satisfaction” award from the American Institute of Real Estate Professionals. Chris said, “It’s all about putting the needs of your clients above your own at all times. We don’t just focus on executing the transaction, rather, we focus on fully understanding what exactly our client’s goals are, and building a relationship based on trust, communication, and reliability. 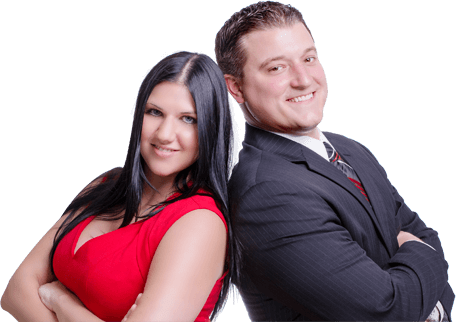 Our direct involvement with our clients through every step of the process is what makes us different from other agents.” Ruth and Chris are full-time real estate agents with the Keller Williams Signature office in Katy, Texas. “From our experience, we know that one approach does not fit all, and that each and every person is different, with varying goals and objectives. With that being said, we are committed to providing a highly personalized level of service that is unique to each person we serve. Our goal is to make every client feel like they’re our only one. Ruth and I are Katy homeowners ourselves and believe in building a community worth living in. We understand how important this process is for our clients, and we value the opportunity to help them with their real estate needs. A wise man once said that a person should never mess with three things in another person’s life…their home, their family, and their finances. In this industry we have the special privilege of being involved with all three at the same time! It takes an experienced agent and one that truly understands what’s at stake at all times, to consistently deliver for their clients. We are honored and humbled to receive such an award, and truly feel that it is a testament to the people we get to work for on a daily basis. My partner Ruth and I would like to extend a special thanks to everyone who has been a part of the Ruth/Chris Real Estate experience!”. The award was presented by representatives of the American Institute of Real Estate Professionals, who said, “We recognize Real Estate Agents, like Chris Glapa and Ruth Sayers, who have excelled in their respective fields. 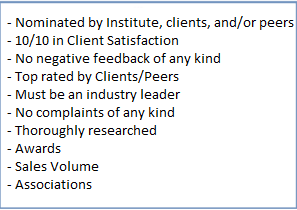 These individuals are what we consider the best in the industry for client satisfaction. It is our mission to do so that the prospective new client will be able to take this knowledge and use it in making the tough decision on what Real Estate Agent or firm to hire. It is the intent of American Institute of Real Estate Professionals to aid these prospective new clients by saving them time and effort in their own research. We strive to make the most accurate and comprehensive list possible and rely on many different sources to determine the level of client satisfaction that a specific Agent or firm provides. Most importantly are the nominations of the client and/or peers in the field. We encourage both present and past clients to make recommendations. We also encourage other Real Estate Agents to make nominations. These nominations aid us in the selection process are can be, what we feel, is the most accurate indication of client satisfaction and usually serves as the catalyst of the nomination and selection process”. • Having done so with an impeccable Client Satisfaction rating. Many Real Estate Agents can achieve high degrees of success but this is often times at the expense or satisfaction of the most important person- the client. The American Institute of Real Estate Professionals looks for Agents that have achieved unparalleled success but most importantly have done so for the benefit of their client. Very few Real Estate Agents can do so and our organization recognizes this significant achievement. Their rating system helps clients throughout the United States make educated decisions when it comes to choosing their Real Estate Agent. Membership is an exclusive honor and extended only to those select few who have reached the top of their profession while doing so with the client’s satisfaction being of the most paramount importance. American Institute of Real Estate Professionals: Recognizing excellence. Allowing clients to make wise decisions.